The past few months my main house projects have been putting together the nursery and a big boy room for my older son. I haven’t been much of a decorator in the past but this time I really enjoyed it! I did a few crafty projects for both rooms and the one I wanted to post about today was some painted canvas art for the nursery. 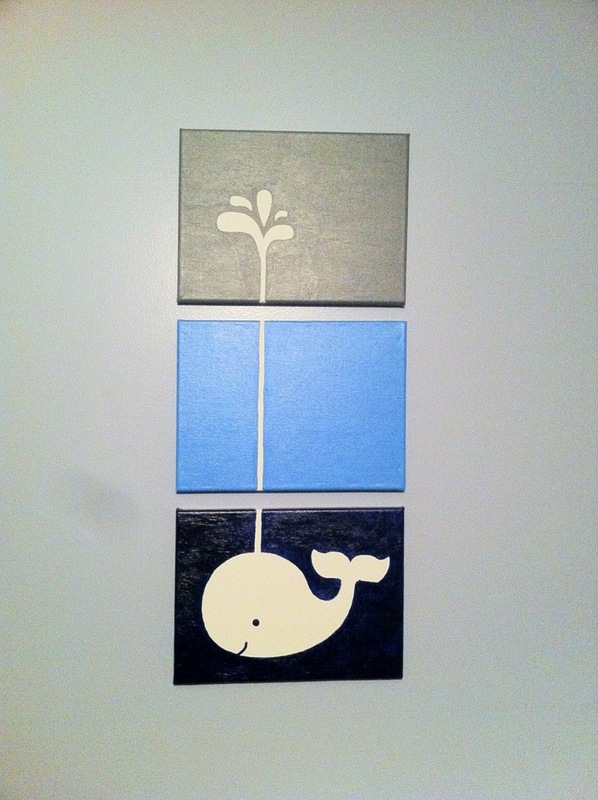 I saw the idea on the blog Simply Stavish when I was searching for whale nursery ideas. Then I googled the whale art a bit more and found another version on Full Plate Living. I loved the idea and thought it looked easy enough so I decided to go for it. I actually painted that! Can you believe it? It really was simple too. I started with three blank 9×12 canvases. I bought two 2 packs at Michael’s when they were 40% off. Here is a similar item on Amazon: Artist Canvas 9×12 . 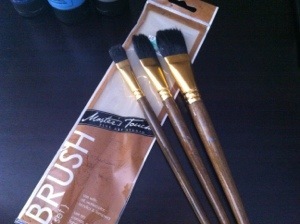 Then I picked up some acrylic paint and paint brushes at Hobby Lobby. 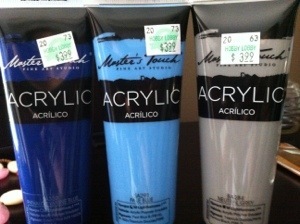 The colors are phthalocyanine blue, pale blue and neutral grey. The brushes were a three pack of different sizes on sale. I don’t know the first thing about brushes or paints so I just picked something that looked decent and wasn’t too costly. There was no way I was going to free hand draw the whale. I know my drawing skills and they are terrible. I asked Benzo to make me a stencil that coordinates with the wall decals we had purchased and he obliged. 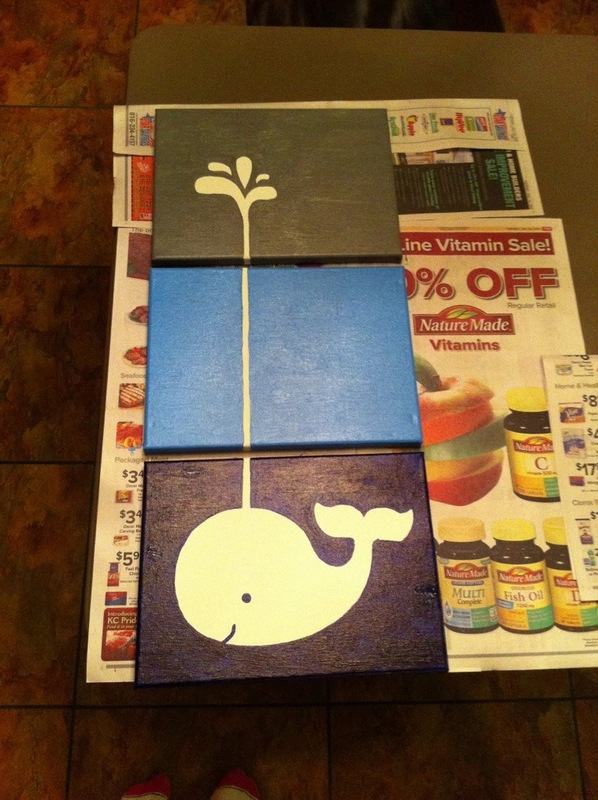 He made me a stencil of the whale and the water spout in Photoshop, which I printed and then traced onto the canvas. I did have to free hand the long line of the water on the middle canvas to extend the water up higher than in the decals. The actual painting was quick and easy. I just laid out some newspaper and went to work painting around the outside of what I had traced on each one. I left the white part the color of the canvas, as in I did not paint it with white paint. I did the whole project in two evenings after my son went to bed, spending about an hour each night. I absolutely love the way it turned out. I had so much fun painting it, now I want to paint more canvases for our house. I was thinking it would be fun to make different canvas paintings for different holidays and have a place in the house where I can switch them out periodically. For fall I thought some falling leaves or a tree would be fun with shades of orange, red or yellow. There are a lot of possibilities! Your whale painting look so much better than the ones on the other 2 blogs you mentioned. What a treasure for your child! LOVE it! Well done. Can’t wait to see the room tour! Your painting turned out so cute! I’m so glad it sparked an interest in painting. Thanks for linking back to Full Plate Living. Be sure to come back and visit again!